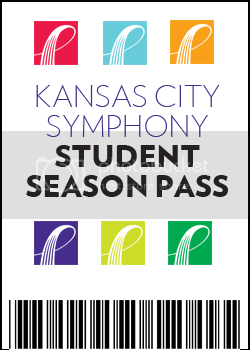 The Kansas City Symphony Student Season Pass is available to any student 30 years or younger with valid enrollment documentation. Limit one pass per student. Student Season Passes are non-transferable. If you are a parent wanting to purchase more than one pass for your children please contact the box office at (816) 471-0400. Once we receive the copy of your enrollment documentation and age verification documentation, we will mail the pass and you may start making ticket reservations by calling the box office at 816-471-0400. Student Pass valid for CLASSICAL SERIES concerts only on a space available basis. Seating assigned at box office discretion. Reserve tickets in advance of the concert. *Blocked concerts are subject to change without notice. Keep in mind that even though the student pass is not available for those performances, you may be able purchase a student rush ticket for $10.00. Student Rush tickets subject to availability. General Admission: $25.00 Sold Out!